Smaller mosquitoes are better at transmitting diseases than larger ones. Researchers in the US fed mosquitoes blood contaminated with dengue virus and tested them for infection. Smaller-sized mosquitoes showed higher infection rates and greater potential to transmit the virus. Even a slight difference in the body sizes of Asian tiger and yellow fever mosquitoes, the main transmitters of the dengue virus, drastically altered their potential to transmit the virus. The researchers, from Illinois Natural History Survey, Oklahoma State University and University of Florida, cautioned that other components like longevity, host preference and feeding frequency also determine a mosquito's vectoring ability and need to be considered in future studies. The findings are to help devise mosquito-control strategies and evaluate risk of diseases like dengue. 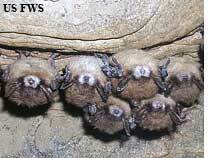 A fungus may have caused the white-nose syndrome, a condition associated with the death of over 100,000 hibernating bats in northeastern US. Geological Survey microbiologists identified the fungus: a member of the Geomyces group that lives in soil, water and air and is capable of growing and reproducing in very cold temperatures. Data showed that the disease spread to other cities from where it was first spotted in New York in 2006. Genetic studies on the fungus from distant caves showed that the microbe was introduced recently. If so, the cause may lie in human and animal movements through these caves, the researchers said. It is not yet clear whether the syndrome emerged due to the fungus or whether it already existed in caves and began infecting bats after they were weakened by some other cause. A new software can help identify cracks in bridges. The software can examine a photograph of a bridge for damages, even at an early stage, and mark the damaged area to alert inspectors ofany problems. Developed by scientists from Fraunhofer Institute for Industrial Mathematics in Kaiserslautern, Germany, and Italian company Infracom, the software also gives the extent of damage. The scientists first built a database of images featuring different types of bridges in Germany that had experienced various kinds of damage and categorized the type of damage. The categories included dampness, discolouration and type of material used to build the bridge. After new photographs of the bridges were fed into the system, they were compared with those in the database. The software determined if there were irregularities and allowed the inspectors to determine how serious the damage was. Italy has been using this software for the past six months. The earth's crust is stretching to a breaking point in north Ethiopia, making way for a new ocean. The African continent is gradually splitting apart along the East African Rift, a 3,000 km-long stretch from Malawi in the south, through Tanzania, Kenya and Ethiopia, to join the Red Sea and the Gulf of Aden. Eruption of an enormous plume of hot, partially molten rock in the Afar region is the cause of the stretching of the earth's crust to a breaking point. In September 2005, a series of fissures suddenly opened up along a 60-kilometre section in the region. It started with a big earthquake and continued with moderate tremors. These movements, the scientists said, are only the beginnings of what would be needed to create a new ocean but the entire process--land stretching and sinking, combined with a massive deluge from the Red Sea--which could put Afar at the bottom of a new ocean, will take millions of years. They added that it was a unique opportunity to study the rupture process, which normally happens on the floor of deep oceans. Researchers from a group of universities worldwide are conducting the study in phases. dna studies of two species of songbirds in northwest US showed that one of the species has overpowered and displaced the other species from its habitat. Males of the dominant species even mated with the females of the weaker species, said a University of Washington study. About 400,000 years ago, encroaching glaciers split a single warbler species into two groups that eventually became distinct species--Hermit warblers living in coastal areas; and Townsend's warblers, living inland. When the glaciers melted, the Townsend's warblers gradually expanded their range northward, pushing the Hermit warblers out of the coast. The Townsend's living along the coast are identical to those in the interior, except for one difference--those on the coast carry in their genes the mitochondrial dna of Hermit warblers. A certain type of bacteria, Wolbachia, protects flies from disease-causing pathogens. Researchers from the University of Queensland first injected a fatal virus to Wolbachia -infected vinegar flies. The bacterial infection was expected to make the fly more susceptible to other pathogens, but it protected the flies instead. Wolbachia is common in insects. The researchers said studying the mechanism of how the bacteria protects the insects could help devise control strategies for insect transmitted diseases.